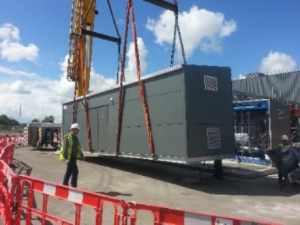 Packaged Plantrooms | Pak Plant Ltd.
Euro Gas Pak Plant have been at the forefront of Pre Packaged plantroom construction in Ireland for over 15 years. 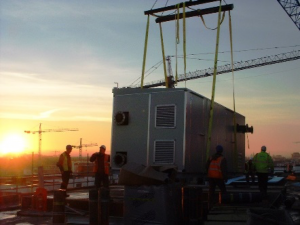 Our units are constructed within a factory environment ensuring the pre-packaged concept provides a fast and effective means of production to meet the ever increasing demands of the construction industry whilst also providing the highest level of quality. This concept of pre or purpose designing packaged plant rooms is to ensure that the most effective use of floor space is taken up by the plant room. 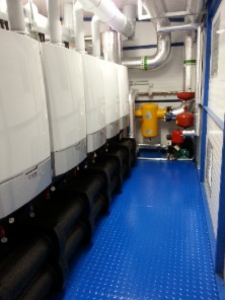 Significant cost savings are realised by not having to create plant rooms within the building envelope. The pre-packaged plant room is manufactured by a skilled workforce in a factory environment. Emphasis is placed on developing a workshop programme tailored specifically for each project, ensuring production time is maximised. The pre packaged plant rooms are subjected to continuous design reviews, with improvements being implemented at appropriate times, the final objective being to achieve the correct balance between ease of construction, function, appearance and cost.